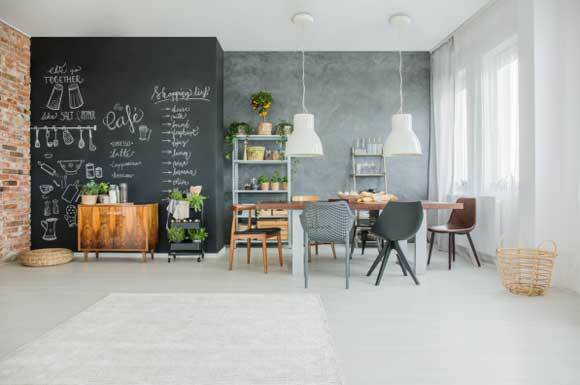 The hottest interior design trend in 2018 is an eclectic combination of styles and eras. Call it what you will, French Provincial, parisian apartment or warehouse chic, it all it all adds up to one thing; creating hip, edgy appeal using a combination of select pieces and designer touches. Anyone who has attempted to implement it, can attest to the fact that blending styles is tricky. Make a wrong move and instead of urban chic, you may end up with op shop naff. The secret is to put a great deal of planning into making a room look like it has taken none at all.. Prior to selecting any furniture, perfect the base. This means tying walls, floors and window treatments together to create a sumptuous canvas from which to build your ‘story’. Neglect this step and no matter the quality or beauty of the furniture you import, it will be diminished by the setting. Exposed brick and contrasting textures, as seen in the image above, create the perfect basis from which to build. Pay close attention to floors and finishes. Polished timber flooring lends itself perfectly to the ‘warehouse’ or ‘industrial’ chic styling which best showcases blended decor. Someone once said, referring to fashion, ‘buy one good piece and accessorise around it’. This mantra can also be applied to interior design. Set a stage with one or two quality pieces of furniture, such as sumptuous reclining chairs, a magnificent sofa, or a solid, vintage dining table. Selecting a multi-layered, complementary colour palette will require taste and a discerning eye. When contrasting colours, use matching styles and vice versa. As an example of this, a pair of wing back chairs can be used in contrasting colours and tied in with matching fabrics for ottomans, lampshades and cushions. As can be seen in the above image, three colours:, grey, white and black, have been utilised to bring mismatched furnishings together. Combined with timber accessories and trim, the resultant effect is deceptively understated yet exuding a chic, urban appeal. Don’t be above borrowing other people’s ideas and making them your own. Gather inspiration from magazines or online sources, and execute it with your own personal flair. Create personalised artwork or a photo gallery with black and white prints. Use recycled and upcycled lamps and introduce repurposed ladders and similar rustic items, to create impact and drama. Finally, intermingle different styles rather than group them separately. Select pieces which have similar lines, for example the curved lines of rolled arm chairs blend well with other furniture with similarly rounded lines. Seek balance. If blending multiple styles and eras, aim for uniformity in theme. Create casual or informal spaces using soft fabrics, rustic furnishings and earthy tones. For formal areas, introduce less eclectic, more structured furniture.